If you are planning a wedding it is important to factor a professional wedding videographer into your budget. Getting married is one of the most precious moments in one’s lifetime; you want to make sure all the special moments are recorded for you to relive throughout the years. Planning your wedding can become hectic (and expensive) very quickly. Sometimes people make the mistake of knocking the professional wedding video off the budget list, only to regret it later. At VideoArt Productions of the Tampa, Clearwater and St. Petersburg area we know exactly what to capture and how to best format and edit it to maximize the documentation process. You have spent far too much time planning this event to not enjoy every moment to the fullest extent! You won’t have to pick and choose what you document. You can only be so many places at once, and we know that on your special day you’re going to experience everything. With packages that actually allow us to be in multiple places at once with multiple cameras, we can be everywhere at once so you won’t miss a thing! Everyone will be able to enjoy the day. Let your family, friends and most importantly, yourselves, enjoy the wedding entirely by letting our professional wedding videographer handle capturing all the special moments of your day! Some people assume pictures and videos taken by family and guests will suffice, but it is nearly impossible for any of your guests, even your family members, to be able to concentrate on giving the documentation the special attention it deserves. You’ll have all the highlights and most precious moments on one DVD. Between getting ready, the ceremony and the reception, there is simply too much going on for one person to capture all of the moments and string them together in one piece of exceptional work. You need professionals. Videos capture so much more than pictures. Pictures can only capture so much. They don’t offer the sound, movement, voices, music, etc. that videos do. 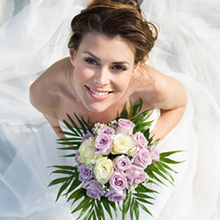 Having a professional wedding videographer will add life to your memories. VideoArt Productions offers the most complimentary wedding documentation you can get! We will fit your schedule, needs, taste, and budget. We have over 30 years of experience in the industry and are an Emmy Award winning company that gives high profile experience to even the smallest jobs. As your professional wedding videographer, on your special day, we will make sure we capture all of the many emotions experienced, from the happy tears to the joyous laughter.